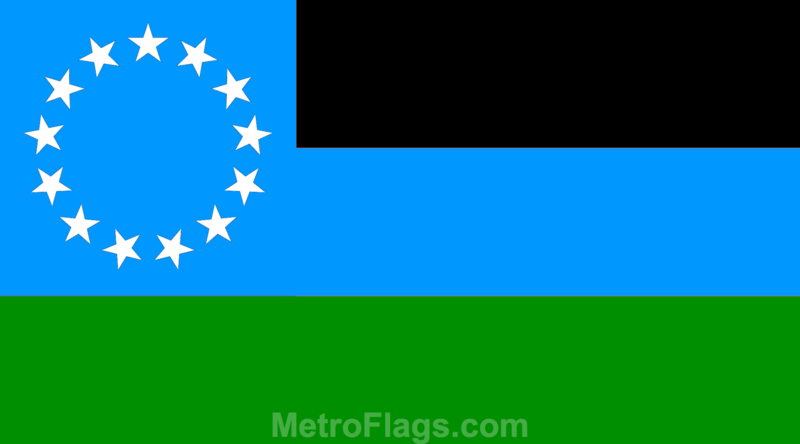 The Flag of the World Government, designed by J. Alfary, can also be called the "Flag of Humanity & the Unity of Nations". Green stands for Earth, humanity, human progress and unity, agriculture, and life. Blue stands for the United Nations, hope, water, the atmosphere that allows us to breath, and the skies that allow humanity to travel, seek, and explore. Black stands for the darkness of space, hardships that humanity will overcome, and the last frontier of human exploration and settlement of the Solar System and beyond. The Thirteen Stars on the flag represent the various regions of Earth that would be under the authority of a World Government: North America, South America, the Caribbean/Atlantic Regions, Europe, Eurasia & Central Asia, Africa, East Asia, Australia, Antarctica, Pacific Oceania, South Asia, Middle East, and the Maritime Regions.